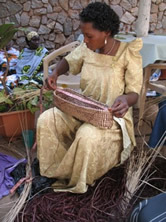 Saata, especially “Ginger” is the brainchild of an American designer that liked the look of Njulu baskets but needed to use the flexible raffia material that could be dyed any colour. Saata baskets are those that reveal the inner part of the weaving: the golden banana leaf stems, through limited use of raffia. These baskets save on raffia and take advantage of the beautiful texture of banana leaf stems. Experimentation in 2007 and a suggestion from a buyer led to artisans dying banana leaf stems. We can now dye the raffia and the banana leaf stems giving customers a larger design range. Limitations: Banana leaf stems that are revealed in baskets must be of the highest quality and dried fully in the sun for 3 to 4 days to avoid black spot and poor colour. We recommend therefore that orders are made outside of the raining seasons to ensure quality work. Also these baskets can not be used in a bathroom or on a surface exposed to water.